Five Little Ducks has been a favorite song in our house for quite some time. We first heard it when our oldest daughter began preschool and now that our youngest is in Pre-K, we're hearing a lot more of it. Like...a lot. Seriously. 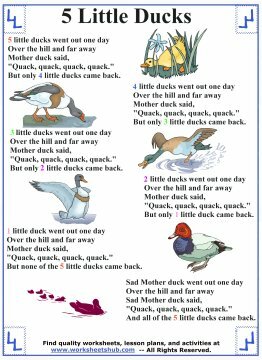 Okay, so maybe it's not our favorite song anymore, but it's a great song for teaching counting skills...and...what kid doesn't love making 'quacking' sounds? Preschool learning involves lots of activity: moving around, jumping, making noise. This past week, my daughter brought home an activity from school that goes along with this song. It's a great task for working on fine motor skills, counting, and your child's duck call! Below are three different worksheets. The first one has the lyrics for the song. You can use this to read to your child, but most likely, she'll already know the words. I've highlighted the numbers so you can point out 1 through 5 with your child. 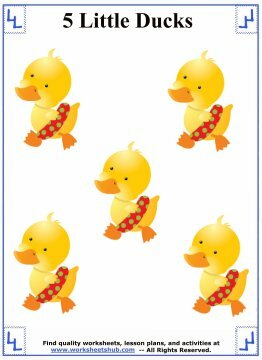 The second printable has five little ducks on it. Have your child cut these out and then glue them onto a Popsicle stick. These can be used to sing the song in the same way you'd use a thumb to sing "Where is Thumbkin?" Our daughter had a blast making the little ducks jump around and dance to the song. The third sheet has Mother Duck on it. Your child should color mama, cut her out, and then glue her to a stick as well. It may work better if you glue a t-shaped cross together and then glue the mama duck to it. It's a bit big to simply glue to one stick like you do with the smaller ducks. To print out your worksheets, just select one of the images below. This will open a downloadable PDF in another tab. Simply download it and then print it out. Grab your scissors, glue, crayons, and then warm up those vocal chords! Once everything is colored, cut out, and glued it's time to sing the song. This is a chance to get involved with your child. One of you be the mother duck and the other one be the little ducks. My daughter enjoys being the Mama duck and "Quacking" to her little baby ducks. As you sing the 'go out to play' part, have the ducks waddle around in front of you and then put them behind your back. 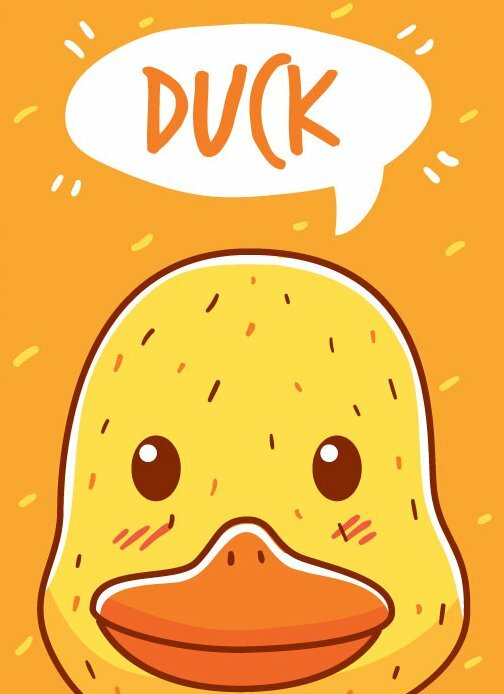 Bring out Mama duck for the "quacking" part and then bring out one less duck from behind your back. Just keep doing this and following along with the song. Kids will love the quacking, hiding the ducks, and then bringing them all out from behind their back. 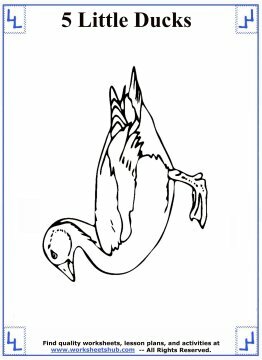 If you enjoy this activity you might want to check out these 5 Little Ducks books and cd's. For more Preschool activities and worksheets, try the pages below.